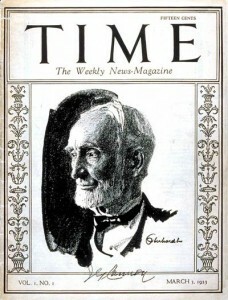 Time is published weekly from New York City. It’s a news magazine that has always focused on informing readers of the day’s current events, with concisely written articles and emotional photography. The first issue debuted in March of 1923. Time was founded by Henry R. Luce, a Chinese born citizen with a passion for news, and his Yale schoolmate Briton Hadden. Time did more than just establish reporting, it changed how magazines actually presented news. Important items were divided into “departments” that covered everything from law and religion, to sports and international affairs. It used a lively layout that emphasized the visual aspects of news and created a stylistic approach to delivering news. By 1927, Time had over 150,000 readers. It was on track to become one of the most influential news magazines in the world, rivaling existing publications like The New York Times. After Hadden died in 1929, Luce took over management of the publication. He brought his moderate, conservative viewpoints to the magazine and altered some of its reporting based on those ideals. He stepped down as managing editor in 1964, and the magazine returned to its centrist viewpoints shortly after. The magazine enjoyed a good run until the dawn of the 2000s, when the move toward digital forced them to do some restructuring and layoffs to keep the company afloat. The Time magazine of today is no longer just an American publication. Editions are published in several foreign languages, and the magazine also includes coverage of the “Person of the Year” and an annual 100 top list of events from the year.